Ordering a class or day pass online is easy! Sign in, add a class or pass to your cart and make a secure payment. Remember to bring and print out your receipt and waiver with you! WHO: Men and women over the age of 65 with certain retirement or Medicare benefits. WHY: Maintain a healthy lifestyle as you age. HOW: Call 404.638.7195 for more information, or stop into the center. One in five people over the age of 65 are eligible for this free fitness benefit through Healthways. If you’re a group retiree or part of a Medicare health plan you may already have a Silver Sneakers membership. Stay Fit, Stay Active, Have Fun! The Kroc Center offers a variety of classes geared toward Seniors. Our Silver Sneakers Classic Senior Mixx class is great for staying flexible and active and provides gentle cardio and strengthening workouts. 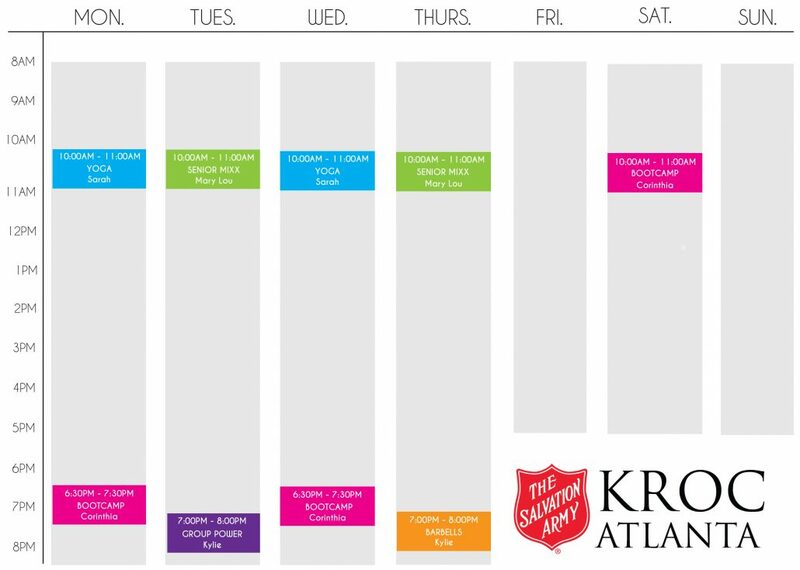 Regularly, Kroc staff will bring in partners to provide health & wellness, healthy eating, financial, and/or informational workshops for our seniors. Keep an eye out for displays in the center for dates and times of these classes. Check out the fitness and gym schedule below!